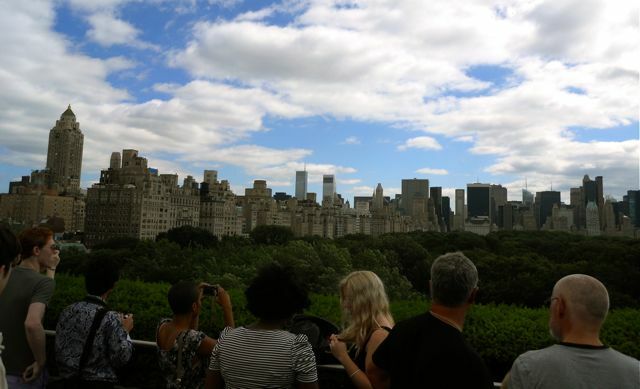 The Manhattan New York skyline as seen from the top of the Met Museum. 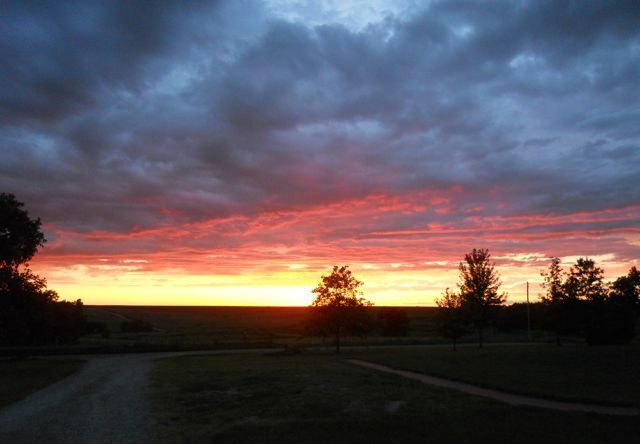 A Kansas sunset (near Manhattan) as seen from my cousin's porch. I know Manhattan Kansas could be targeted as being “less than” a city like New York (no Broadway here), and yet I found it like any place that people inhabit; a place of its very own unique culture and identity. A location in the world, that any artist worth their salt could find inspiration and “culture” in. I saw t-shirts with this emblem for sale in Manhattan Kansas and found them to be very witty. Seems these folks were content with their Manhattan. In New York I found it curious how many of the artists were from somewhere else in the United States and had moved to Brooklyn or the like to “make it.” I guess I knew it would be that way, but it made me wonder what would happen if they just stayed in their own communities and invested there? Some of these “New York” artists would even fly to their home town to seek inspiration and then come back to New York to make art work. That struck me as odd. Why not just show in your gallery in New York and live in your home town and continue to invest and be influenced by the culture there? In the flattened world that we live in it seems there is a lot of value in contributing to the local community, with the easy access to connections we have to the global one. Personally I rather see artists investing in home towns creating places and works of inspiration and influence where they are at. Isn’t that what we’re supposed to be doing? One night I was in New York’s Manhattan watching the sun go down after negotiating the city streets and buzz of life and flashy lights, and three weeks later I was on the highest hill at my cousin’s farm outside of Manhattan Kansas after we had tended to cattle in the late afternoon feeling a breeze and hearing the buzz of critters, watching the twinkling of fireflies and the sun dip below the horizon. Both Manhattans indeed were full of life, but I’ll admit, one left me feeling much more connected to this planet than the other. This entry was posted in Curious Endeavors and tagged a sense of place, live local, Manhattan, Manhattan and being an artist, Manhattan Kansas, Manhattan New York, place and the artist. Bookmark the permalink. I came to your site to thank you for the Robert Brain, Friends and Lovers, book recommendation. I have located a copy and look forward to the read. 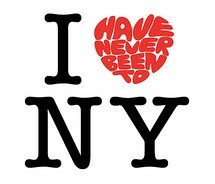 Having lived both in Manhattan, Kansas and Manhattan, New York I agree with your conclusion about the two Manhattans. I now live and make art in a rural area that feels more authentic and less man-shaped but the city is my preferred destination for vacation. I have enjoyed seeing your blog and artwork. It seems as if some people need to feel validated in a certain way or in a certain place…”If I can make it there, I’ll make it anywhere….” Investing talent and time in one’s own sphere of family, friends and community does make the most sense.